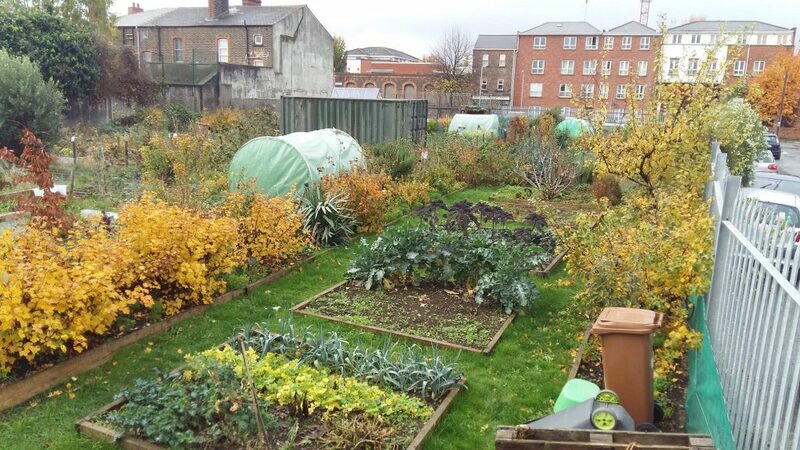 In the midst of Dublin’s housing crisis and ongoing property development in an increasingly densely populated city, locals of Dublin’s Liberties district are desperately fighting for the survival of their community gardens and allotments at Weaver Square. 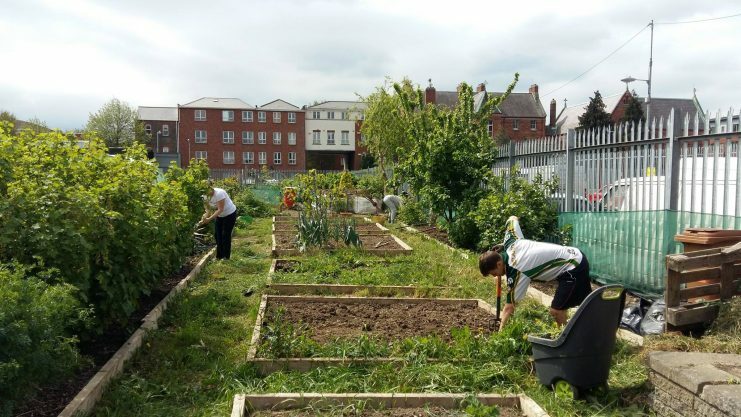 The space consists of 27 individual allotments, managed by Dublin City Council and rented out to individuals, as well as a community garden that is shared used by various groups including the South West Intercity Community Network. Located just off Cork Street, the gardens have become a community hub and an agrarian escape for residents both young and old from the concrete jungle that is Dublin’s inner city. The Liberties, in particular, is one of the most deprived areas in Dublin in terms of green space, with the added kicker of lack of any alternative social and recreational spot in the area. Boasting a wide range of seasonal fruits and vegetables, including kale, rocket, cabbage, sunflowers, and many herbs, the garden and allotments provide food and recreation to those who use them. This urban utopia for the people of Dublin 8, however, is being threatened by plans to demolish the space in favour of rapid build social housing. Just yesterday evening, an emergency meeting was called by locals after it emerged that Dublin City Council plans to start exploratory work on Weaver Gardens on Monday. The meeting will be held at the F2 Community centre in Rialto today. The group campaigning for the preservation of the space – Save Weaver Square Community Garden & Allotments – argues that the gardens have had a huge impact in the livelihood of those involved, and locals agree. “You recharge your batteries just standing here,” according to Ivanna Chovgan, who works with the South West Intercity Community Network and coordinates a variety of programs and workshops using the community garden. Some of the workshops include working with children, teaching them about growing and cooking their own food, as well as an adult program exploring the benefits of agro-therapy for those wishing to improve their mental health and wellbeing. Witnessing the resilience of nature, Chovgan says, helps to boost confidence and self-esteem. The stress that would be caused by the loss of such a resource at Weaver Square would be a great misfortune for the local community, she says. In the centre of the garden and allotment space, a greenhouse built from recycled plastic bottles collected by local children indicates how the space has been used to engage younger generations in issues related to sustainability. A recent research paper published by the journal Nature Ecology and Evolution also acknowledges allotments as a solution to combatting a range of social and environmental issues. The paper states that allotments are beneficial for human health and wellbeing, while urban agriculture is considered important for food security and poverty alleviation. The study found that community gardens and allotments are very effective in increasing biodiversity and that allotments in particular are disproportionately important for plant–pollinator community robustness. In addition to boosting biodiversity and improving the mental health of the individuals involved in their maintenance, the gardens and allotments at Weaver Square have facilitated social cohesion in the community. “It’s a great social platform”, Chovgan says, as “there’s a good inter-generational communication as well as different backgrounds and different countries”. The Save Weaver Square group stresses that while they recognize the urgency of Dublin’s housing crisis, and that the demands for accommodation need to be met. Locals, however, are frustrated by the fact that the authorities are failing to address the needs of future residence by “not building providing green spaces for the people they’re building for”. In Paris, a campaign launched by the mayor’s officer in 2016 is working towards a goal of canvassing 247 acres of Paris’s rooftops with greenery by 2020. The planning in Dublin’s inner city pales in comparison to such greening strategies, the campaign group says. Locals are becoming increasingly frustrated, Chovgan explains, when the area fails to get community resources, all while there are facilities for “transient communities, for tourists and students that are here for just a few years and then move on”. Just a short walk from the community gardens at Weaver Square, Uninest New Mill Student Residences offers luxury student accommodation starting from €241 per week. Locals argue that Dublin City Council is failing communities by allowing the building of luxury accommodation in spaces which should be used to build affordable housing. “I think people are just annoyed that there is no provision for the city, no plan for this area.” Chovgan says. Earlier this year, several markets in the Liberties were forced to leave Newmarket Square to make way for development in the area, including the Green Door market and the Dublin Flea market. The order for the local community to vacate Weaver Square just signifies one of many community resources lost in the past year, Chovgan says. In a statement, Dublin City Council said that the site is owned by the Council and zoned for residential purposes and that it “was always intended to develop housing on this site”. “There is a housing crisis in Dublin City and we have to make best possible use of the limited land bank that we have,” the Council said. “We are trying to source an alternative location in the Dublin 8 area to cater for the allotment licensees currently using this site,” the statement continues.